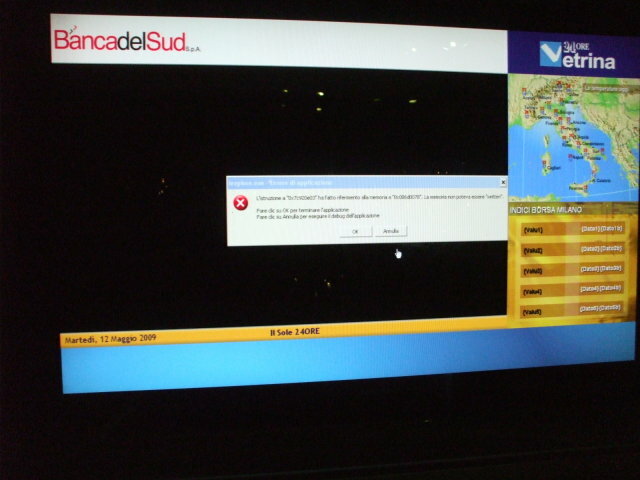 These are some pictures I have taken of unexpected crash screens in public places. 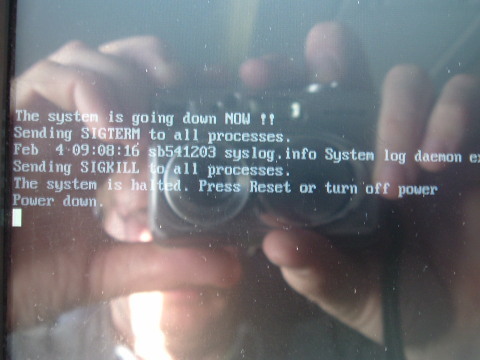 Just as with my Toilets of the World page, I am only interested in crash screens I see and photograph myself. So no, I do not want me to mail you ones you see. Create your own page and gain all the fame and fortune this one has brought me. 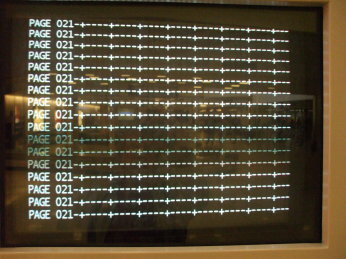 Houston's George Bush International Airport (IAH), flight status system, 1121 local, 21 January 2007. I should probably point out that the airport is named for George H.W. Bush, the father. 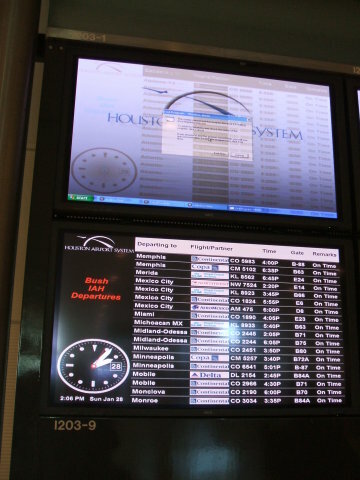 The second of these is at Houston's George Bush International Airport (IAH), flight status system, 1406 local, 28 January 2007. 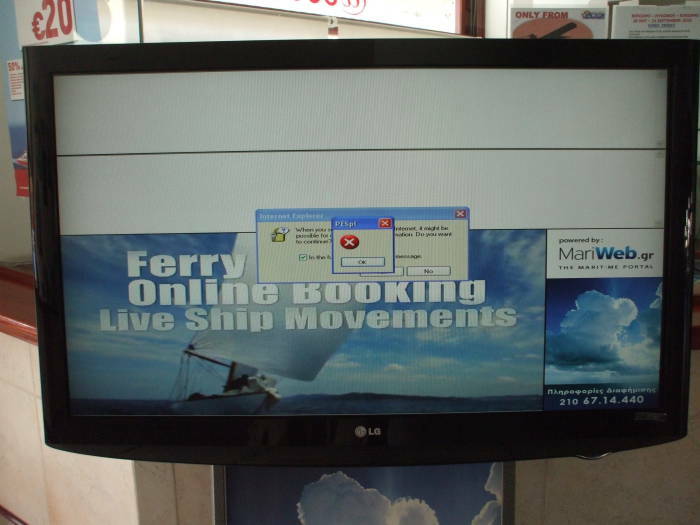 Yes, just one week later I passed back through and saw a different bank of monitors crashed again. 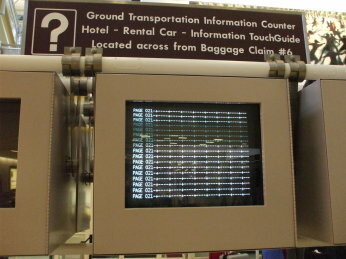 Detroit airport (DTW), flight status system, 2051 local, 19 Dec 2005. 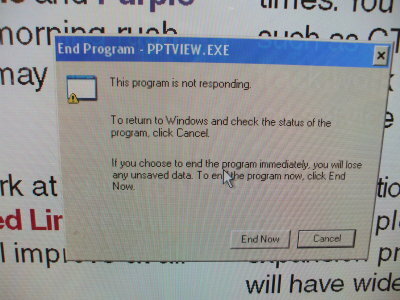 This Windows application cannot respond to the End Task request. It may be busy, waiting for a response from you, or it may have stopped executing. 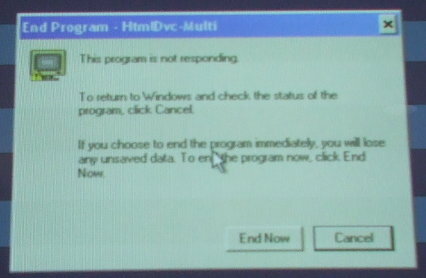 Press Cancel to cancel and return to Windows NT. Press End Task to close the application immediately. You will lost any unsaved information in this application. Press Wait to give the application 20 seconds to finish what it's doing and then try to close the application again. Well, that would be helpful advice if we had a mouse. Or a keyboard. 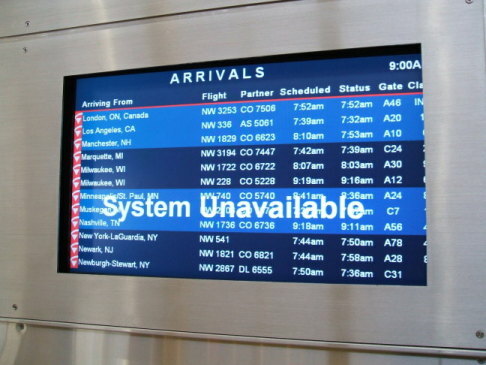 Detroit airport (DTW), flight status system, the first of these is at 2051 local, 19 Dec 2005. 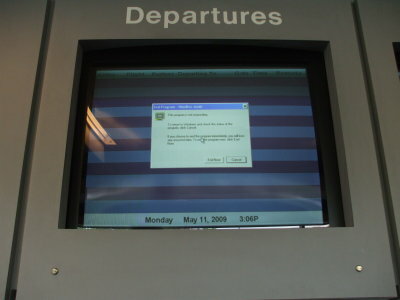 The second of these is Detroit airport (DTW), flight status system, 0946 local, 23 July 2006. 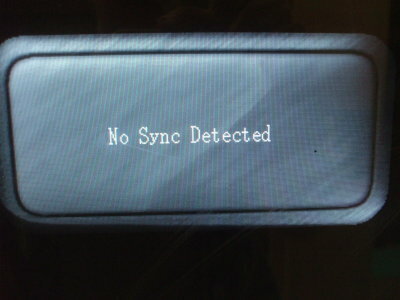 The display had been frozen for 46 minutes. Minneapolis — Saint Paul (MSP) airport, an advertising screen in the shopping center in the main hall. Chicago O'Hare airport, 1506 local time, 11 May 2009. Can it be possible that the nation's busiest airport has no departures? 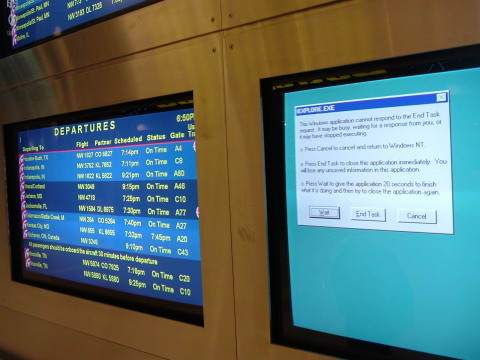 No, the program HtmlDvc.exe is hung up and so the system can't show us any departure information. 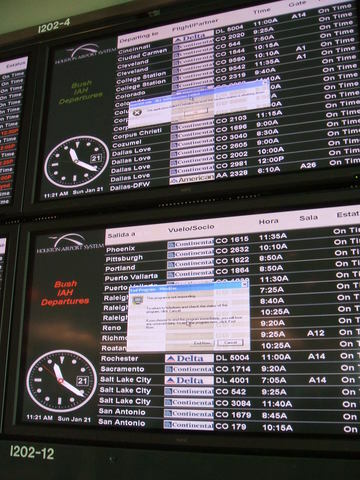 As it clearly shows, it's 12:37 PM, Sunday, July 18, 2010, at Chicago O'Hare Airport (ORD). But that's all it shows. There are two empty sub-panels that seem to be intended to show MSNBC video. 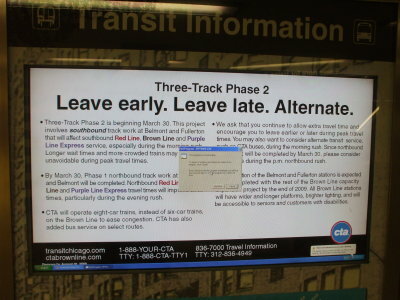 Now, if only this process would just terminate, and some supervisory process notice that, and get this display back to doing something more useful than showing a Windows error message. Here's an 01d 5k001 crash screen. This is at the baggage claim area in the new terminal at Ronald Reagan Washington National Airport (DCA) in Washington, D.C. PAGE 021, it wants us to know. And what would appear to be some ASCII art table columns and rows? 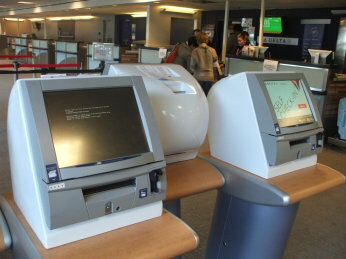 These are the Delta self check-in terminals at the Montgomery, Alabama (MGM) airport check-in area. 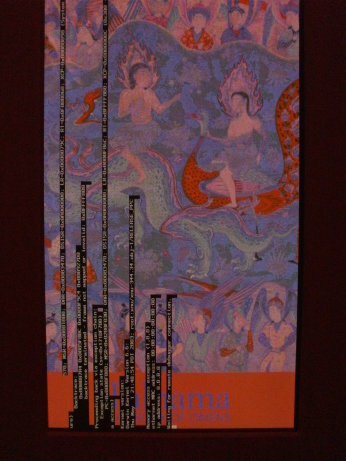 1300 local time, 4 December 2010. The operating system is missing. This looks bad. 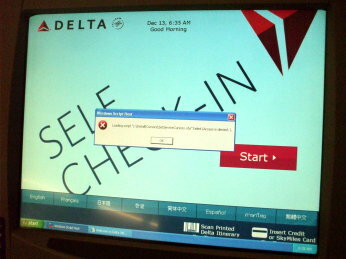 Here's a different Delta self check-in terminal failure just nine days later. 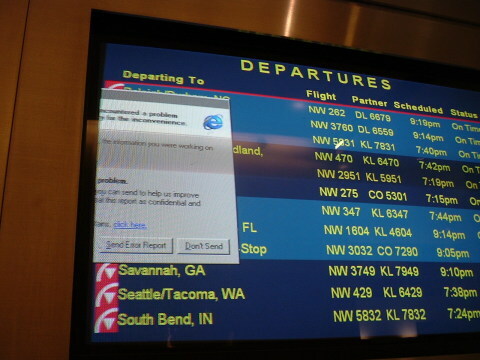 This is at the Indianapolis, Indiana (IND) airport, 0634 local time, 13 December 2010. 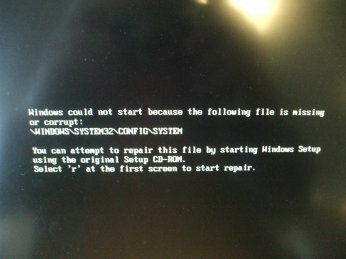 This one failed because of a file permission problem with a Visual Basic script. Loading script "c:\Install\Cursors\SetServiceCursors.vbs" failed (Access is denied. ). 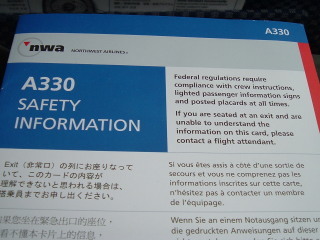 On board Northwest Airlines flight 32, Detroit to London Gatwick, 4 Feb 2006. 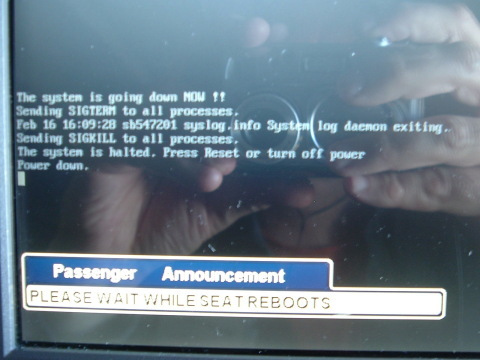 The Airbus 330 seatback entertainment systems run Linux. 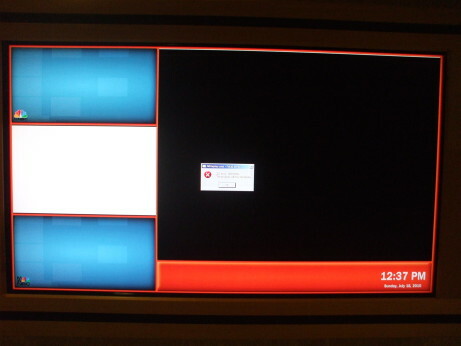 It appears to be an ARM embedded system with a CramFS file system, beyond that the reboot was too fast to keep track. If you stress the entertainment application enough, the application will crash. The system is configured to run just one instance of that application, so init will halt the system when the application fails. In other words, the configuration file /etc/inittab has a line saying once where it should instead say respawn. 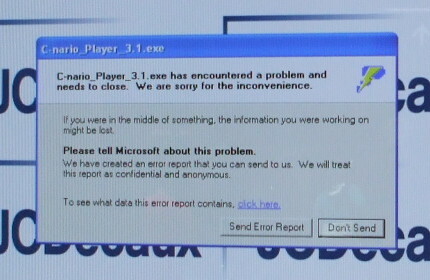 After about 60 seconds, some watchdog chips notices that the system has halted and resets the system. See the Linux Journal article for someone else's report about this. 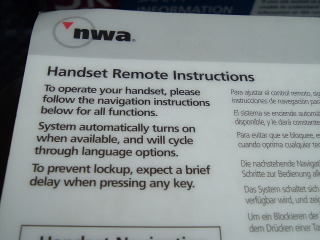 Northwest later started giving you a card reading "To prevent lockup, expect a brief delay when pressing any key." In other words, give it time to catch up after every button press. 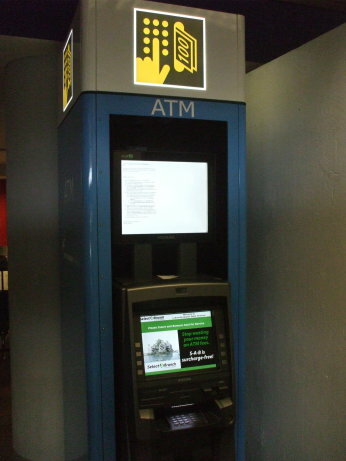 This is a cash machine for Banca del Sud in Napoli, Italy. 2143 local time, 12 May 2009. L'istruzione a "0x7c920e03" ha fatto riferimento alla memoria "0x006d0078". La memoria non poteva essere "written". 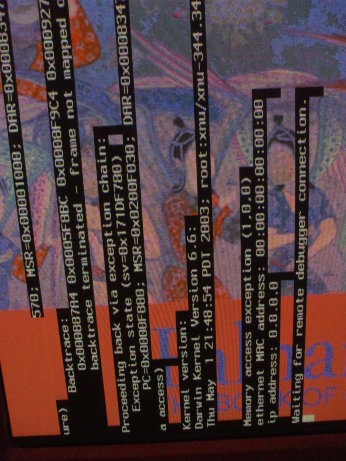 The buggy program tried to write to non-writable memory. 1630 local time, 4 September 2010. 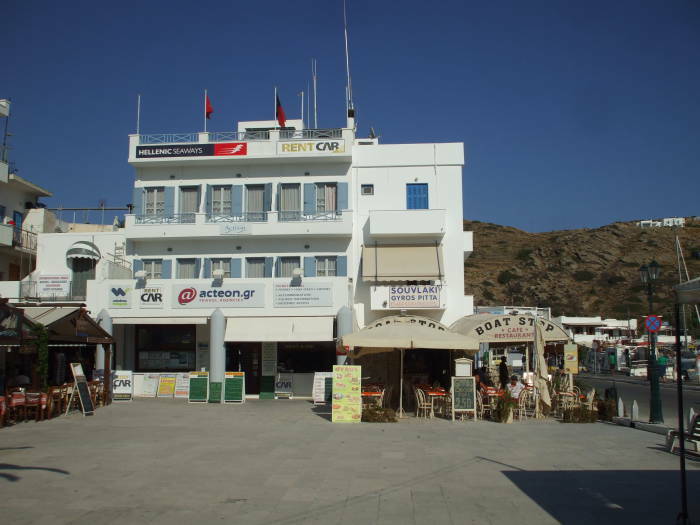 I'm just trying to buy some Greek ferry tickets, on the island of Ios. 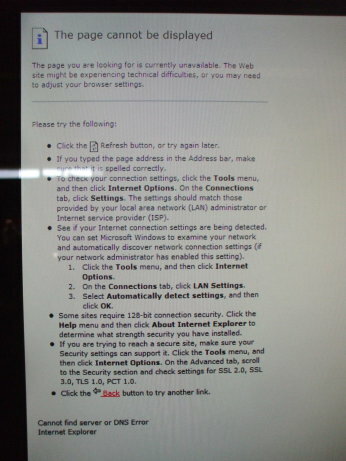 But Internet Explorer is warning us that someone could intercept network traffic (despite being told not to do that again), and something called PESpl is being even more presistent in telling us, well, it's not clear exactly what. But there's a big red X and it wants us to agree to that. 16:47:22 local, 13 June 2010. Good news — Colored chalk still works! 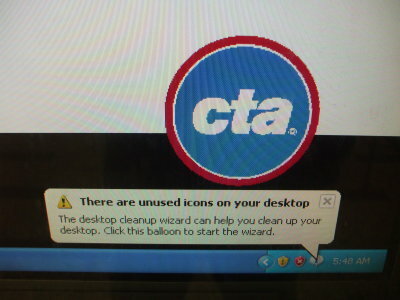 The Chicago Transit Authority, popularly known as The El, has old-school trains but some current-day communication problems. Here's a case where the display signal disappeared. 2023 local time, 10 May 2009. 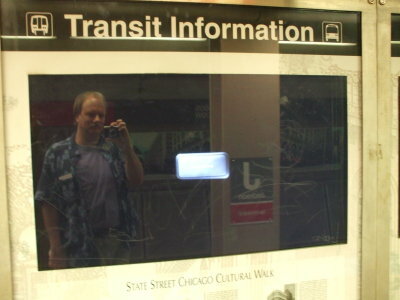 At least people looking for information about the State Street Cultural Walk through The Loop can be informed that the flat-panel display is detecting no synchronization signal. Here's another display crash on the Chicago Transit Authority, popularly known as The El. 1620 local time, 17 June 2009. Leave early. Leave late. Alternate. 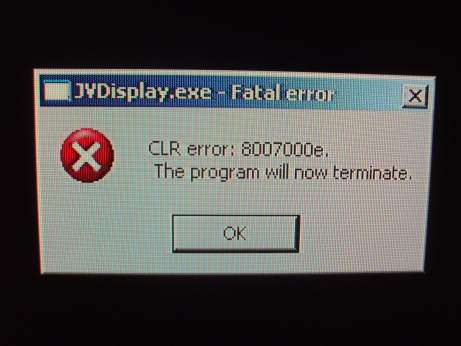 The system has crashed. 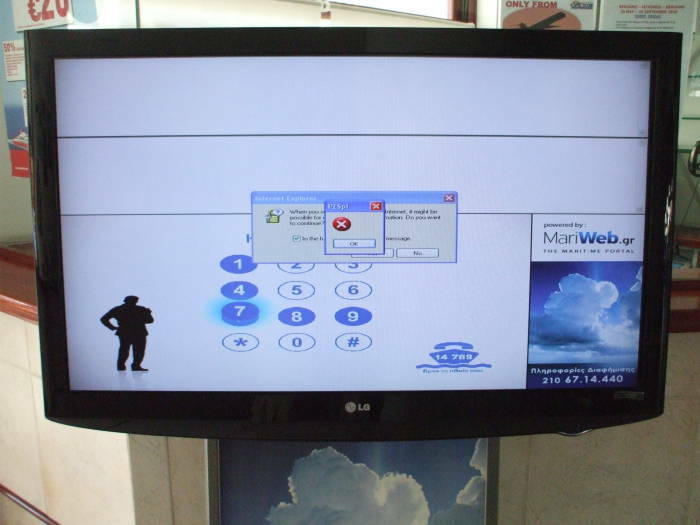 Well, not the entire system, just the buggy PPTVIEW.EXE program. 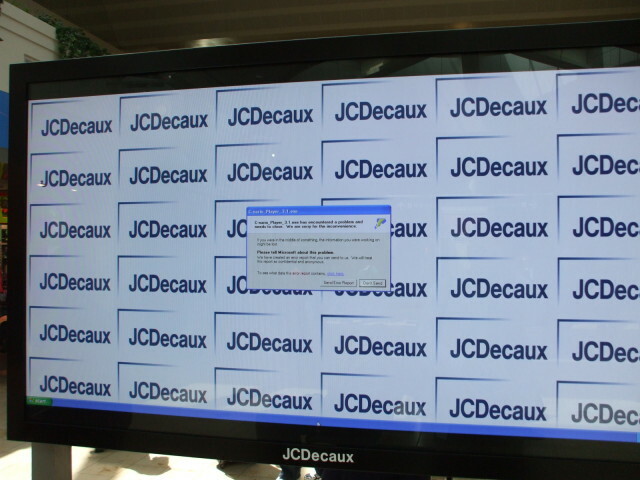 But that renders this display just as useless as a complete system crash. Meanwhile, Windows helpfully points out that while its applications may be horribly unstable, maybe we would like to delete some unneeded icons to pass the time. There is a wizard to help with this task. Too bad there isn't a wizard to keep things running correctly.